Image by Metro, St. Louis Mo. Recently, we discussed how Metro could improve its unlimited passes for both regular commuters and visitors. Here's what you said. Also, to help make a specific recommendation to WMATA, I'd like to pose a few more questions. In the original post, there were 43 comments. Combining multiple comments from one person, there were 30 comments which made specific suggestions or gave feedback (some were just discussing side issues). Readers generally praised the current SelectPass, which lets you pick a price for your regular commute, pay 36 times (18 round trips) that fare, and then get all other trips of that price or less for free. For longer trips, you pay the difference. Many readers said they use the SelectPass and like it. You were fairly unified in arguing that the SelectPass should include bus as well in the current rail-only pass. A regular rail commuter would then get free off-peak bus riding, for instance, which is something Metro would benefit from encouraging. Twelve people specifically suggested this in their comments. A few people also suggested making bus and rail transfers free in general, as most other cities do. Since rail fares are variable, in practice how this would work is from rail to bus, there would be no further charge. For bus to rail, just give the bus fare (now $2) as a credit against the rail fare and charge the extra. At least three people commented on the difficulty of automatically getting SelectPass with SmartBenefits each month. They suggested offering a way to make SelectPass automatic, or finding another solution. To get a SelectPass with SmartBenefits, your employer's benefits administrator has to assign your benefits to passes. Then, you have to wait until it appears on your SmarTrip at the start of each month and buy the pass. Reader Ross's employer puts benefit money on a debit card instead of the SmarTrip; Ross can then use the existing auto-reload feature to charge the pass to that card. Wait, there's an update: Metro fixed this yesterday. Now, you can sign up for auto-reload with regular SmartBenefits too. The first time, you do have to wait until the first of the month, but once you activate auto-reload, it will process the renewal before the end of the month but wait to actually charge you until the 1st when the SmartBenefits arrive. Reader "Not telling" suggested making the pass good for any 30-day period instead of a calendar month, to avoid problems around getting the SmartBenefits money on the 1st of the month and having to buy the pass the same day. The passes need more marketing. Multiple readers said that the pass isn't communicated enough. Pmk180 said many friends had not heard of it. Reader "Why" had not heard of the SelectPass before. Four readers suggested simplifying the fare structure, such as with zones. In DCST's discussion with staff from Destination DC, the tourist marketing organization, and area Business Improvement Districts, another issue which came up was equity. Though passes can be more appealing, some people can't afford to put the whole fare up front. One proposed approach would be for local jurisdictions to partner with social service organizations to get reduced-fare passes, such as half price, to low-income residents. What do you think? I've set up a survey to get your thoughts on these ideas and the visitor pass options below. Image by Alexander Steffler licensed under Creative Commons. Readers generally felt that visitor passes were not working right now. The feedback (seven comments with specific complaints) was that it was too complex, too expensive, and too hard to use. Several readers suggested establishing three-day and (more) seven-day passes for tourists as well as the current one-day passes and (now very expensive) seven-day. A big question we discussed was how to limit a tourist pass so that it is cheap enough for most tourists' short-range trips, but which won't undercut the long-distance fares. Doug suggested a pass for just DC, Arlington, and Alexandria. Chris suggested setting up a "tourist zone" and a fare of $3.50. Matthew L suggested having such a "central zone" but also adding a home station, perhaps where there is a hotel. There is actually an existing pass which may be close to what we need: the seven-day "short trip" pass. This offers trips up to $3.85, which is the off-peak max fare. This pass now costs $38.50 (ten rides). At peak, $3.85 actually gets pretty far. Remember, despite how it looks on the diagrammatic Metro map, stations at the ends of the lines are much, much farther apart than in the center. 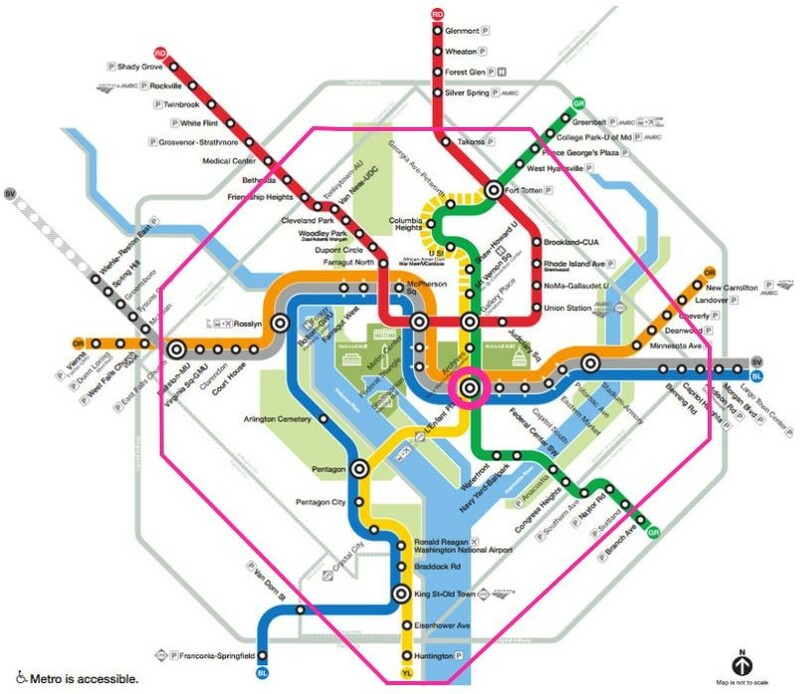 For a tourist staying at L'Enfant Plaza, this map shows what stations they can reach for $3.85 or less at peak. During off-peak, it's all of them. Stations reachable for $3.85 at peak from L'Enfant Plaza. Image by the author from base map by WMATA. So, how about a one-day, three-day, and seven-day option for each of two passes: the current "short trip" pass (but maybe give it a better name), and the full pass? In the survey, you can say what you think of this idea. Is a $3.85 fare level right? Should it be higher or lower? The current 1-day unlimited pass is $14.75 versus a max fare of $6, so it's two peak long distance trips plus $2.75 more on top of that. Few people use this pass. A one-day "short trip" pass could be somewhere a bit over the price of two rides ($7.70, if you go with a pass good for rides costing $3.85 or less). Should the pass have a round number price? What about the pass plus a SmarTrip card (which costs $2)? For instance, the pass could be $8 and with a SmarTrip (which tourists will likely be buying) a very even $10. Or, the pass could just be an even $10 with the SmarTrip card free. Let's look at the three-day. How much should that be? No more than three times the one-day, obviously. Two times? Two and a half times? And then, the same question about round numbers comes into play. If the one-day is $8, 2x is $16, 2.5x is $20. Should the pass with a SmarTrip card be $18 (2x plus $2)? $22 (2½x + $2)? $20 (a nice round number in between)? Give your thoughts on the survey. Besides these questions, readers had some interesting suggestions. Reader cmc brought up the idea of a family pass, a discount for buying, say, four passes together. That's because for a family, Uber/Lyft fares are often lower than four Metrorail fares. However, if Metro can get a family on a pass, they'll use transit more, especially off-peak when there is extra capacity. Mike T liked that idea, and also suggested deeper discounts for conferences. Similar to the current U-Pass now offered at American University, convention organizers could pay in bulk for passes for 5,000 attendees but not actually pay 5,000 times the fare. Rather, Metro would compute the likely percentage of convention-goers who'd ride transit and how much, then sell the passes at that fractional rate with some markup. For instance, if about half of people will ride Metro, the passes could be 55 percent or 60 percent the price of 2,000 full passes. While charging full fare could mean more money if conventions use it, in practice few do. The current one is expensive: it's $30 for three days for unlimited rides but most convention attendees are staying at hotels nearby. You'd have to take eight rides at $3.85, or 16 rides at the minimum fare of $2, in three days to make it worthwhile, and only a small fraction of convention-goers would likely do that. The survey will ask you about these ideas as well. Metro officials are interested in adding some new and better passes, but they want rider feedback first. Take the survey now!